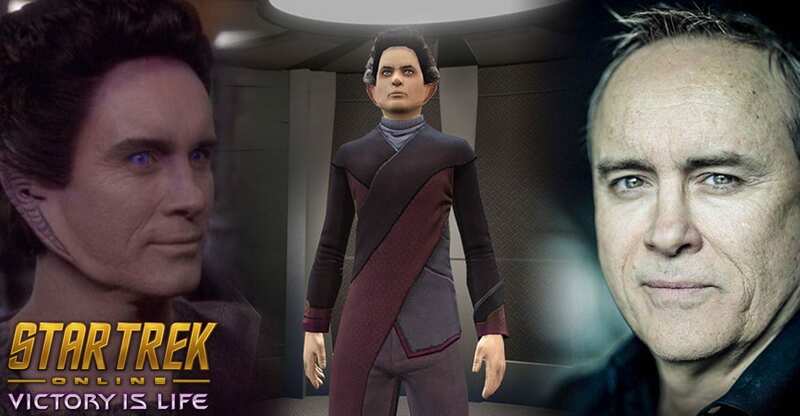 The Star Trek Online team got a chance to catch up with Jeffrey Combs, who plays Weyoun and Brunt in Star Trek: Deep Space Nine and our upcoming PC expansion, Victory is Life. During this time, we fired off some questions from our community that were gathered from Facebook, Twitter and the forums. Read on to gain intel on what it was like to be on the set of Deep Space Nine. Thank you for your kind words. It is a thrill for me to revisit one of the most exciting periods in my career. I cherished my time on Deep Space Nine playing Weyoun and Brunt. It’s a big honor for me to be asked to revisit. It’s kind of like going home a little bit. I’m really happy about it. This is an interesting question. I get this often when I go to conventions. The truth is I look at Weyoun as one character and I never chose to play one Weyoun different than any other. The situation may have changed, so different colors of the character would come out. My thinking was that when Weyoun was cloned, the technology was so good that he came back without missing a beat. He was fully intact with no learning curve, whatsoever. Of course the exception to that would be the so-called defective Weyoun, which did have some problems, according to the Founders. Other than that, I chose to play them all the same. So I don’t have a favorite Weyoun; they’re all my favorite. Exhausting? Maybe being there at 3:30 in the morning to get into makeup. But it was always such a joy to play either one of them. I knew I was one the luckiest actors in LA to be able to have two recurring roles on Deep Space Nine. When I would get booked for an episode, my question was always, “Which character?,” which was a rare thing for an actor. You have to realize these episodes were shot over a period of time. Only on rare occasions was I ever jumping between makeup. It wasn’t really exhausting; I’d say more rewarding. There is one. I believe it’s the third to the last episode of Deep Space Nine that was shot. I actually appeared as both characters. My only request was that they could be on screen together. That would have been delicious. When an idea gets broken down into logistics, that’s a little more difficult and expensive. It would mean that would I have to get into the makeup and have a double get into makeup, and then we’d have to switch out. I was just honored that I had billing where I was Jeffrey Combs as Brunt and Weyoun. I can’t really answer that. They all have their own specific challenges. Some are perhaps a little more fun in a silly way, like Brunt. Really, they were all fun to do. I often get asked which is my favorite, to which I always answer by asking the person if they have children. If I’m lucky they say yes and I’d say, “Which is your favorite?” Then they begin to realize I love them all. Again, it’s hard to answer which is my favorite. What I really like are the differences between them. They were so diverse. I could behind each one, without having everyone know that it’s the same actor. Having said that, Ferengi makeup is hell on wheels. You have these big ears and yet you cannot hear. It’s like a big orange helmet glued on your head. You have no ability to modulate if you’re loud or soft. It’s really like having a big head cold for 15 hours. You can’t imagine the sounds of joy that actors emit at the end of a long, long day when they’re getting their Ferengi heads taken off. Such a relief. I don’t miss that, but it’s a joy, nonetheless to play a Ferengi. That’s a good question. Star Trek franchises are all part of such a well-run machine. Let’s say I make automobiles. Ford is very efficient, no matter what the car is, everything is on a well-made assembly line. That’s what I would say about Star Trek. Very professional. Nothing was less than an attempt at doing the best and providing the best support, be it wardrobe, make-up or catering. I would say that between the different crews, there was some overlap, but really kind of the same vibe. Very efficient, very friendly and professional. They were all incredible. Now you’re asking how greedy am I. I’m blessed to be able to play seven characters, three of which were recurring roles. My cup runneth over. I didn’t want to tempt the fates by wishing that I had yet another one. The other actors already hated me. Not really.At least, I hope not. Because of its challenges, I supposed my favorite episode was “Treachery, Faith and the Great River.” It’s the episode whether there is a supposedly defective Weyoun, who wants to get away from the Founders and join DS9. Of course, he can’t do that, and that was a real challenge. It was a different color for Weyoun; an innocence and a peek into what it would have been like if he were not genetically altered to be completely and unquestionably loyal to the Founders. It was an interesting challenge as an actor and featured some really great story writing. And of course, it was great to be able to spend an entire episode on a shuttlecraft with the great René Auberjonois as Odo, a dear friend of mine. Probably Brunt because he would cheat and therefore he would win. Or I think Weyoun. I don’t know, maybe Shran. I can’t decide. How about I play three poker games with each one and see how it goes? Please convey to my Star Trek fans out there that I’m deeply moved by their kind words. Live long and prosper and long live Star Trek.